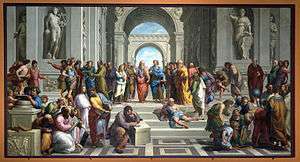 The School of Athens, by Raphael, depicting the central figures of Plato and Aristotle, and other ancient philosophers exchanging their knowledge. A philosopher is someone who practices philosophy, which involves rational inquiry into areas that are outside of either theology or science. 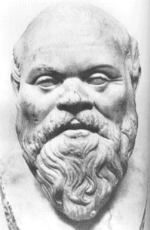 The term "philosopher" comes from the Ancient Greek φιλόσοφος (philosophos) meaning "lover of wisdom". The coining of the term has been attributed to the Greek thinker Pythagoras. In the classical sense, a philosopher was someone who lived according to a certain way of life, focusing on resolving existential questions about the human condition, and not someone who discourses upon theories or comments upon authors. Typically, these particular brands of philosophy are Hellenistic ones and those who most arduously commit themselves to this lifestyle may be considered philosophers. While Pythagoras coined the word, the first known elaboration on the topic was conducted by Plato. In his Symposium, he concludes that Love is that which lacks the object it seeks. Therefore, the philosopher is one who seeks wisdom; if he attains wisdom, he would be a sage. Therefore, the philosopher in antiquity was one who lives in the constant pursuit of wisdom, and living in accordance to that wisdom. Disagreements arose as to what living philosophically entailed. These disagreements gave rise to different Hellenistic schools of philosophy. In consequence, the ancient philosopher thought in a tradition. As the ancient world became schism by philosophical debate, the competition lay in living in manner that would transform his whole way of living in the world. Later during the Middle Ages, persons who engaged with alchemy was called a philosopher - thus, the Philosopher's Stone. After these individuals, the Classical conception had all but died with the exceptions of Arthur Schopenhauer and Friedrich Nietzsche. The last considerable figure in philosophy to not have followed a strict and orthodox academic regime was Ludwig Wittgenstein. In the modern era, those attaining advanced degrees in philosophy often choose to stay in careers within the educational system. According to a 1993 study by the National Research Council (as reported by the American Philosophical Association), 77.1% of the 7,900 holders of a Ph.D. in philosophy who responded were employed in educational institutions (academia). Outside of academia, philosophers may employ their writing and reasoning skills in other careers, such as medicine, bioethics, business, publishing, free-lance writing, media, and law. ↑ Russell, Bertrand (1946). A History of Western Philosophy. Great Britain: George Allen and Unwin Ltd. p. 10. Retrieved 31 March 2016 – via Internet Archive. ↑ Russell, Bertrand (1946). A History of Western Philosophy. Great Britain: George Allen and Unwin Ltd. p. 11. Retrieved 31 March 2016 – via Internet Archive. ↑ That is to say philosophically - Pierre Hadot, Philosophy as a Way of Life, trans. Michael Chase. Blackwell Publishing, 1995. pg. 27: Introduction: Pierre Hadot and the Spiritual Phenomenon of Ancient Philosophy by Arnold I. Davidson. Citing Hadot, 'Presentation au College International de Philosophie,' p. 4. 1 2 Pierre Hadot, Philosophy as a Way of Life, trans. Michael Chase. Blackwell Publishing, 1995. pg. 32: Introduction: Pierre Hadot and the Spiritual Phenomenon of Ancient Philosophy by Arnold I. Davidson. ↑ APA Committee on Non-Academic Careers (June 1999). "A non-academic career?" (3rd ed.). American Philosophical Association. Retrieved May 24, 2014. ↑ Schuessler, Jennifer (11 August 2015). "Philosophers to Share $1.5 Million Kluge Prize". New York Times. p. C3(L). Retrieved 6 April 2016.